Less than a week ago, Starbucks released its very first LGBT commercial. Not long after, James David Manning, the pastor of Atlah Worldwide Missionary Church in Harlem, claimed Starbucks is "ground zero for Ebola" because of its LGBT appeal. 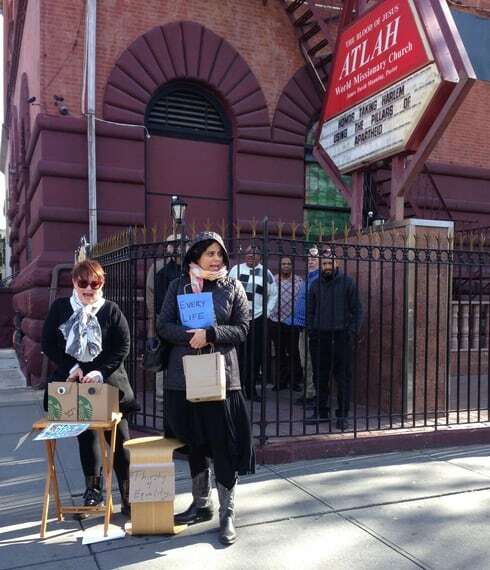 Atlah, located in the heart of Harlem, boasts a prominent sign that displays hateful and homophobic messages such as "JESUS WOULD STONE HOMOS." So a group of us got together and decided to protest this new Atlah message in the most loving way we know: with free Starbucks coffee!